Cate Scott Campbell, Ricardo Chavira, and Zilah Mendoza. Photo by Darrett Sanders. World premiere theatre productions are a roll of the dice not only for the playwright, cast, and director, but for the theatre and its audience as well. Sometimes the theatre gods shine down upon a production and sometimes they don’t. Regardless, the effort is always appreciated and worth the attempt along with the blood sweat and tears of everyone involved. Throughout history, oral storytellers have driven the imaginations of writers. There is something to be said about the craft of writing, in all its various forms, that allows us to capture and appreciate the characters’ experiences and emotions; thus engaging audiences. Without oral history, for example, we wouldn’t have the Bible. It is oft said that everyone has a story to tell. Shakespeare sort of sums it up for us with Hamlet’s comment about ghosts and truth. “There are more things in heaven and earth, Horatio, than are dreamt of in your philosophy.” True indeed. Playwright Rivera’s writing comes down on the side of the ‘magical realism’ style along the lines and vision of the great Colombian writer/novelist Gabriel Garcia Marquez. “Untranslatable Secrets…” in short, is a play about family relations and connections. One twin sister Nikki Corona (Onahoua Rodriguez) is trying to contact her deceased twin sister Abri (Ms. Rodriguez in a double role). She hires the unusual services of an agency operated by Maren (Cate Scott Campbell) that guides its clients seeking to contact those who have left the planet. The play, takes place in the ‘Here and There’ but is set in the present. Instead of a typical linear road trip premise, there are just five actors who play fourteen parts. In order to keep the characters straight and defined in this astral road trip to the ‘other side’. One has to pay strict attention or one could become lost and detached from the story line. Actor Ricardo Chavira plays only the character of Orlando, and it’s a nicely nuanced performance. Another strong performance comes from of Zilah Mendoza, who plays Noelle/Paloma/ Bobbi/and Maria Sol. Cate Scott Campbell also scores as both Maren, the guide agency’s owner in Act One, and as Lisandra, Orlando’s guide in Act Two. Juan Francisco Villa, performs five characters: Manny/Priest/Eldon/Bernardo and Felipe in support. “Untranslatable Secrets…” comes across to me as a production that is more style than substance. Granted, Mr. Rivera is in uncharted waters, so to speak. Only in literature have characters ‘gone over and come back’. So dialogue can be whatever the playwright says the characters say. The play, however, is set in the present which makes the basic premise problematical. And it’s talky and the pacing is glacial at times. Just what are those untranslatable secrets that Nikki Corona knows but won’t let the audience hear? One will just have to come to the Geffen Playhouse to find out. This I can say. We all live in a self-contained absurdist bubble that is whirling through space for unending eternity. We’re here for only a nanosecond in the scheme of things. We should all make better use of our allotted time. Perhaps, playwright Rivera’s whimsical side is at work here in trying to seduce the audience into believing that there’s something magical and fantastical in an afterlife? Like Hitchcock’s illusive, secret plot-device – the ‘MacGuffin – in all his films, that ploy keeps audiences engaged, waiting for more to come. There are echoes here similar to the plight of Becket’s characters in “Waiting for Godot” as well. However, when one is dealing in ‘magical realism’ as a leit-motif, maybe it’s okay just to go with the flow and ditch reality as we presently understand it. The technical credits, however, almost steal the show. The creative team led by director Bonney includes: Scenic Designer Myung Hee Cho, who creatively enlarges the stage and acting space of the Geffen, turning the stage into a veritable Garden of Eden in Act Two. Lighting Designer Lap Chi Chu provides supporting mood-inducing moments. Stephanie Kerley Schwartz costume designs are appropriate as is the sound design by the redoubtable Cricket S. Myers. 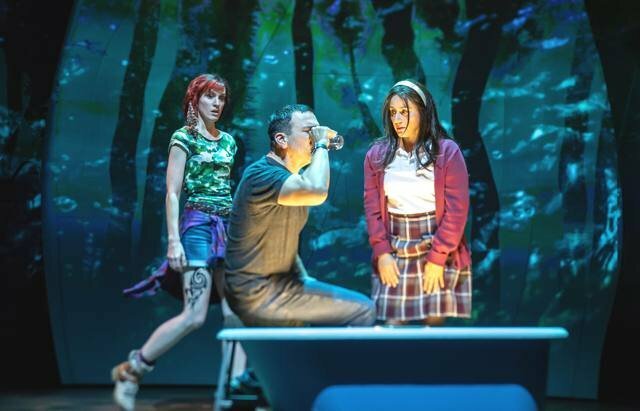 The clever Projection Designs of Hana S. Kim, definitely enhances the overall ’fantastical’ quality and message of playwright Rivera and the vision of director Bonney. “The Untranslatable Secrets of Nikki Corona” performs at the Geffen Playhouse, and runs through October 4, 2018.